With the lens cradled between the thumb and fingers on my left hand, I position the camera's body to my eye and half depress the shutter button with my right index finger. I’m trying to tell the camera what I want to focus on. I like what I see through the lens, so I snap a picture and look at the results. The picture is good, but I want more light flooding in, so I open the aperture another f-stop. Looking at the image, I see all the soft bokeh light behind my current subject of adoration and love that I could capture it in picture form. It is a little crazy, but so worth the pause in my day. The moment captured, took only a few fleeting seconds -once I kicked off the cruise control from 65 miles per hour, and pulled over to the side of the road, as all the other people on the highway hurry on to the next thing. I’m standing here on the side of the road chasing the light that is unfurling and will be gone in a few more ticks of the ever moving clock. Honestly I only use a few settings on my Nikon at all, and those... not so well. Despite the fact I only know what I like when I see it, I find photography a creative outlet for my passion to see the world through His light. My first awareness of this love for photography came in high school. I worked in the camera department at K-Mart. Of course that information there….. completely dates me, but you already knew I’m only young in spirit. My longtime, high school friend, Hazel Kamna and I were both infatuated with cameras, lenses and light. As I remember it, she had a great camera and eye for beauty and I had a camera that was okay with an eye for old barns, bottles cloudy with age and rusty relics from the past. We would take her darling youngest sister, Melissa, (who had the most beautiful skin ever) and we would travel the back roads of our world, shooting pictures all afternoon and sometimes all day. Trust me, it was one of the most responsible ways I ever spent time in my teenage years. My friend was great at capturing the beauty of people in ambient lighting. It is still true of her. She is a beautiful person herself, who sees the beauty in others. She would see the light bouncing off of hair or a face and had a way of making magic happen with that moment. Those were the days when you shot off a few rolls of film, sent them in to be developed and waited to see how they turned out. When the long awaited results were in your hand, only a few shots were much to be excited about and the moments that we were trying to capture were long gone. Still those photos gave form and artistry, to emotions and pieces of our deepest, most honest selves. I took a college class on photography almost thirty years ago. It was fitting that I was trying to learn to develop film in a darkroom, when in my real life, there were mostly shadows and only flickering moments of dim light. We chased light on rainy nights trying to capture the streaming red, yellow and greens traffic lights reflecting off of wet pavement and the night sky with stars like shining pinheads of white, streaming forth. We hid in the dark to develop black and white photos and I learned how to tell my camera to make snow, really white, when our cameras wanted to turn everything to a certain shade of grey. I never did like shades of grey or just black and white, but it taught me a little of real life, of working with shadows and being still and looking for how the light strikes an object. That was before I know the One who is Light. Lately I've been thinking how I love photography, because pictures help to tell a story. And to me, every story, is of Light intersecting with all of life. If we are blessed, that kind of beauty is captured and illuminated through a lens into a single image. And hopefully into thousands of moments captured. Those first moments of a tiny life inhaling oxygen or the glow on a small child's face, as they embrace life just for what that moment is. Or the story told of a person, in the deep lines of their bronzed face or of hands worn thin from years of hard work. With photography I can grasp a tiny bit of God and His glory and save it for later. Because in the everyday moments there is often a disconnect, in all of my connectivity. This world of ours, on fast forward. Swimming through a world-wide-web of words, only a few under 140 characters, not just scrolling but literally rolling through status updates, tweets, and Instagram moments. All the phone calls, e-mails, text messages and to-do lists. Photography brings me back to center. It helps me to move from, "the to-do's" and helps be to embrace, "the to-be's". This is what happens, when I pause, focusing on one subject. When I center my attention on how to capture the wonder my eye is seeing, I get a glimpse of the One who is Light. This is the lesson God has been teaching me all summer. I need to focus -really focus....on what is important in my life. In an ocean of noise and business, the lens helps to narrow in on textures, colors, lines, patterns and light. It is beauty and light colliding, that remind me of God's glory and the wonder of the world He created even through it is so full of darkness and hard things. Yes, that is one of the main reason I love photography. It keeps my focus on all that is light, life and beauty. Could I encourage you to slow down too? Really slow down and focus with me? Notice how, God paints the sky new every single day, weaves a single flower full of color and texture, or how the light illuminates a person's face. We can take these patches of light and weave them around our life and it helps us keep perspective. Light intersecting all of life. Living this one day as light-filled people. 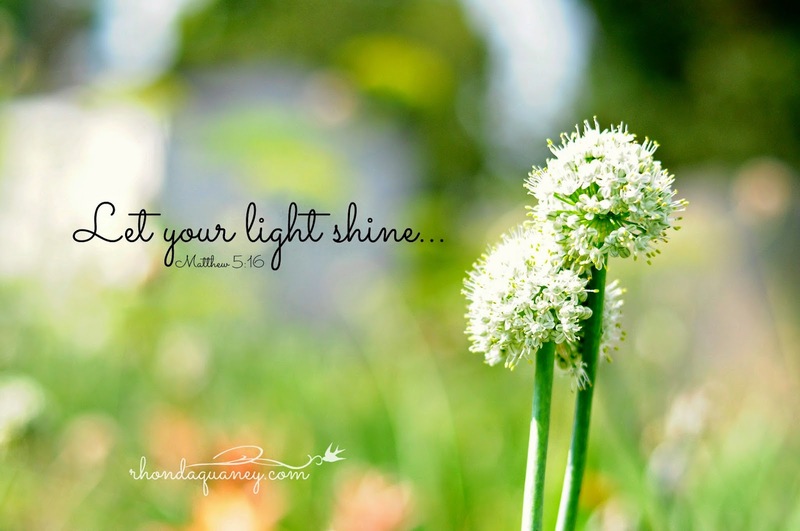 His light, brushing up against those who need to know they are in darkness. My heart desires to tell stories. To do that, I have to see individual beauty, frame and compose lines and bring to life a visual image for readers. Photography helps me to do this, in a unique and completely individual way. Because the truth is, we are each a light and we were made to shine. So no matter where your days take you, look for the path of light as it intersects with your life. In fact I hope you will chase after moments of light. Your life is shining as only it can shine, though you friend. I'd love to have you share some of your thoughts or photos here friends. 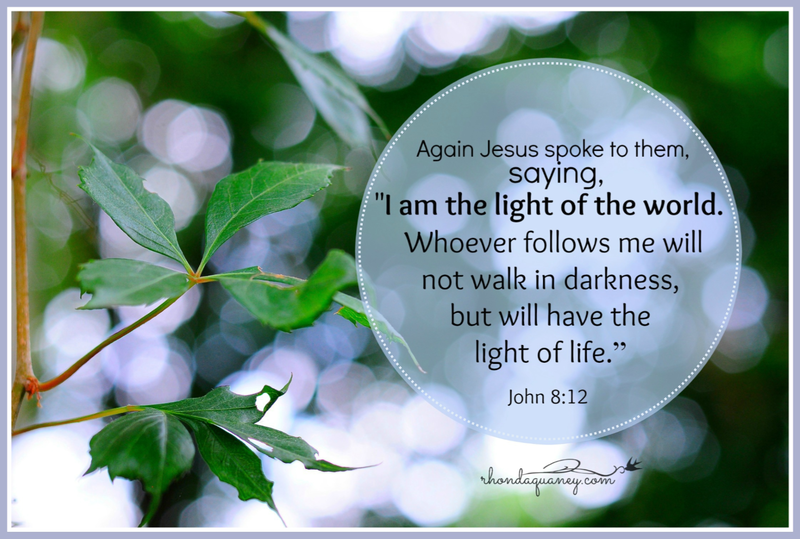 Or send it to my in-box, but whatever you do, chase the One who is light and let your light shine this week. Love and grace to you all.